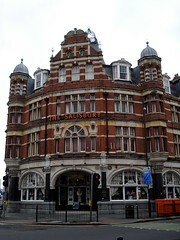 Pub in Harringay, also known as the "Salisbury Hotel". It's a Grade II* listed building, and it's also on CAMRA's national inventory of historically-interesting pub interiors. Food served from 6pm weekdays and all day on weekends. Opening hours and food times taken from the 2008 Good Beer Guide. Last edited 2013-05-10 07:59:47 (version 23; diff). List all versions. Page last edited 2013-05-10 07:59:47 (version 23).